As soon as the Giants season is over - the Cape goes back to the cheap booze. The excuse given was about the new year. I'm not feeling the love. It's probably a good thing. 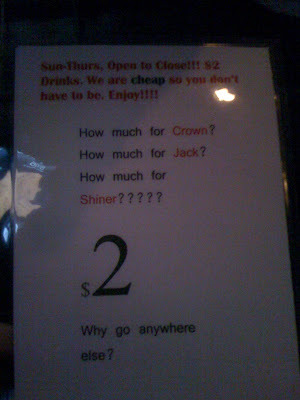 Last time they had $2.00 Crown and Down...I ran naked around the bar . I know some of you are disappointed about the Cape taking them away, but at this time I really don't want the Shock Therapy Treatment to go to waste. What's up with Boss dropping those passes... I say get rid of the gloves pal! I personally feel that we should boycott by not going to couple of games there next season. How would the Cape like that?